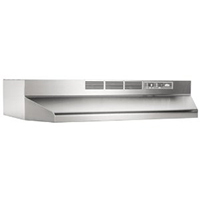 If a ducted range hood isn’t an option for you, then this Broan economy range hood is a viable alternative. Quite affordable at $74, it effectively traps the odors and air impurities that result from cooking. You just have to remember to clean the charcoal filter regularly. The 2-speed fan is a bit noisy, but not so much that it impedes conversations in the kitchen. Best of all, the simple, slim design gives you ample space above and behind the range so you can hang up utensils and cookware. The hood accepts lights up to 75 watts, which provides more than enough brightness in your cooking area.